Tower Fanfares, composition for cast-bell carillon, written at request of University of Florida College of Journalism and Communications for opening broadcast by WUFT-FM, “Classic 89” (1981). Has a soggetto cavato on station’s call letters with toccata, variations and fugue. The first sounds heard as UFs new classic-music radio station went on the air at 3:00 pm on September 23, 1981. UT Fanfares for Carillon, commissioned by The University of Texas at Austin for 1987 dedication of the Kniker Carillon. Three-movement suite, incorporating plainsong melody Ut queant laxis used by Guido d’Arrezzo to develop solmization guide. Selected for performance at Peperbus carillon in Zwolle, Netherlands, as part of 2015 30th anniversary Zwolse Beiaard Stichting composition contest, where it was played by Laura Ellis.. In 2017 the Nederlanse Klokkenspel-Verenigung published all of the pieces played in Zwolle (see cover at right). Solemn Fanfares for Carillon, composition requested by Student Affairs, University of Florida for campus ceremonies following student murders (1991). Aleatoric composition, including medieval melodies associated with death (plainsong fragments from Missa pro defunctoris). Twain Ten Fanfares: revision and expansion of Tower Fanfares (1981), prepared at request of UF College of Journalism and Communications for twentieth anniversary of inaugural broadcast of WUFT-FM, “Classic 89” (2001). Ten variations, and fugue with ten subject entries. Premiere on September 23, 2001. Ring of Bronze, composition for solo cast-bell carillon with brass quintet in the tower answered by antiphonal brass ensemble on the ground, written for opening ceremonies of UF Sesquicentennial Year. Number and letter symbolism. First performance on January 9, 2003, by Jonathan Gil, graduate student carillonneur, with brass quintet, and brass ensemble conducted by the composer. (2003). Further performance on July 17, 2015, by musicians of the Sewanee Summer Music Festival with John Bordley, carillonneur, preceding Evensong as part of the Sewanee Church Music Conference, Polk Memorial Carillon, All Saints’ Chapel, University of the South, Sewanee, Tennessee. Requiescat in pace, composition for cast-bell carillon, written for inauguration of UF Century Tower Carillon expansion to 61 bells by Royal Eijsbouts (coincident with second anniversary of 9/11 attack). Incorporates musical theme from 1918 organ work of same title by Leo Sowerby (2003). Further performance on July 22, 2018, at House of Hope Presbyterian Church, St. Paul MN by Kimberly Shafer, carillonneur of St. Chrysostom’s Episcopal Church, Chicago IL. In memoriam, composition for cast-bell carillon, also written for carillon expansion and second anniversary of 9/11 attack. Incorporates 16th-century melody Herzlich tut mich verlangen, with canon and polytonal elements (2003). The Star-Spangled Banner, full carillon arrangement written for performance on Independence Day, Veteran’s Day and other national holidays. Original tonality, delineation of bar form, carillon ornaments. 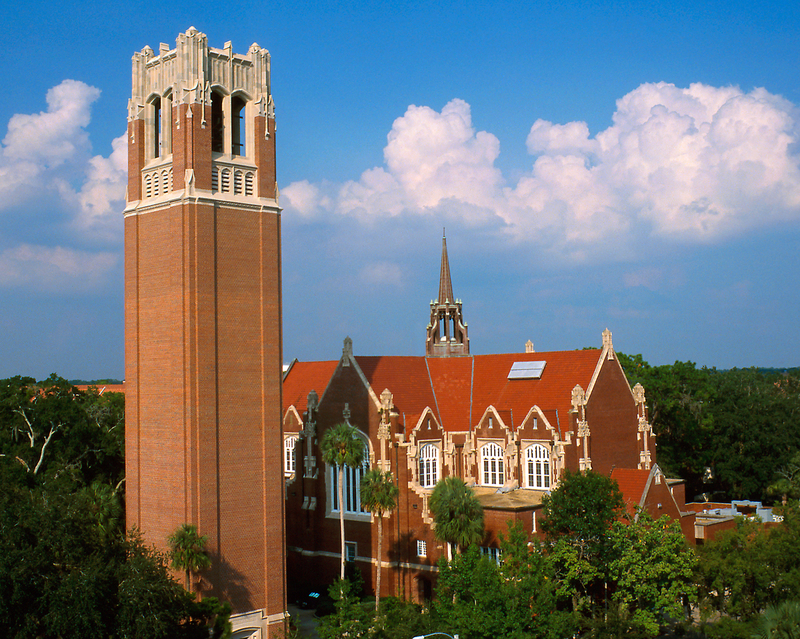 First performance: UF Century Tower Carillon, November 11, 2003, performed by the composer. Phoenix Fanfares: further revision of 2001 Twain Ten Fanfares, written to celebrate return of classical music programming to UF’s WUFT-FM (formerly “Classic 89”) after six-year hiatus. Station call letters form musical material,.and scale numbers signify the year of 2015..